Quality rubber kickstart lever cover replacement for Yamaha motorcycles. It is 65mm long and has internal diameter of 10mm. This kickstart rubber fits to products throughout all Yamaha motorcycle models - too many models to list below. 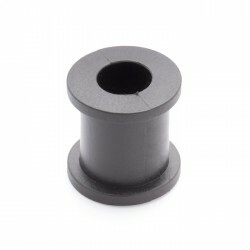 Quality rubber replacement stopper/damper for Yamaha motorcycles. This rubber prevents the side..
Quality replacement front footrest rubber for Yamaha motorcycles. Two are required to refresh the lo..
Quality replacement footrest rubber for Yamaha motorcycles. Two are required to refresh the look of ..
Quality replacement rear footrest rubber for Yamaha motorcycles.Two are required to refresh the look..
Quality replacement rear footrest rubber for Yamaha motorcycles. Two are required to refresh the loo..
Quality rubber replacement carburettor to air cleaner joint - intake rubber for Yamah.. This kit contains two stainless steel rear footrests (120-27431-00) and matching rubber covers (120-.. 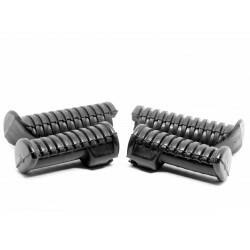 This kit contains two sets of footrest rubbers (122-27413-00 & 156-27413-00).COMPATIBLE MODELS19.. This kit contains two front footrest rubber covers (156-27413-00) and two rear footrest rubber cover..
Quality rubber replacement of blanking plug / rubber cover for Yamaha motorcycles. It can work eithe..
Quality rubber replacement shift shaft dust boot for Yamaha motorcycles. It fits over the shift shaf..
Quality rubber replacement footrest mounting rubber for Yamaha motorcycles. Also matches version 904..
Quality rubber replacement pedal crank cover boot for Yamaha motorcycles.It fits over the right had ..